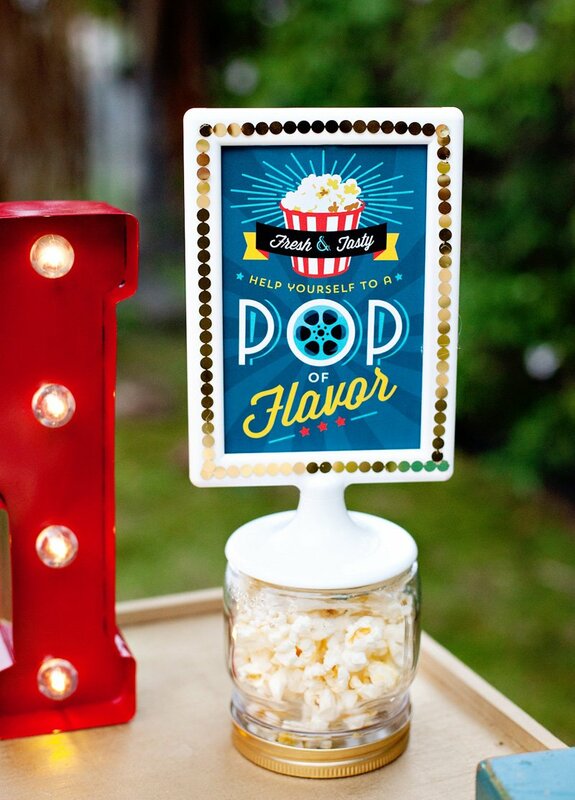 If you’re hosting friends over for a movie night, create a festive atmosphere with a cute little snack table display. I mean, what’s a movie without popcorn and drinks, right?! 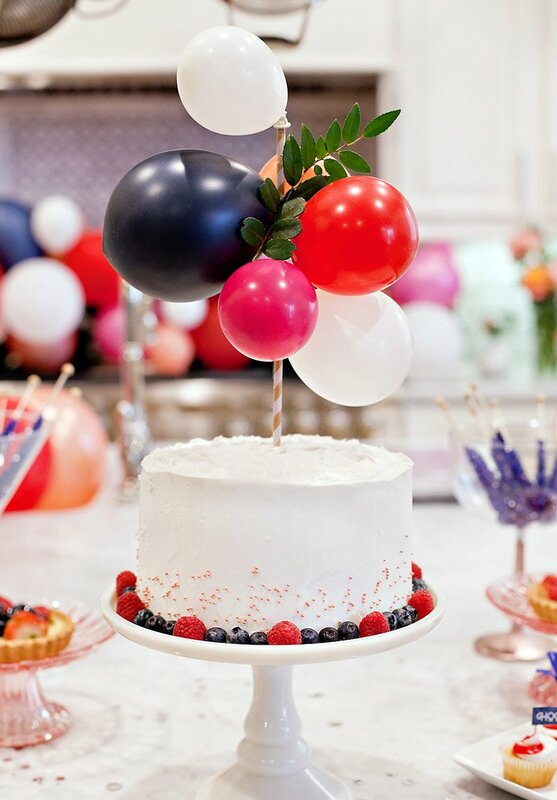 And if you’re a sweet tooth like me, then candy definitely needs to be in the mix too. 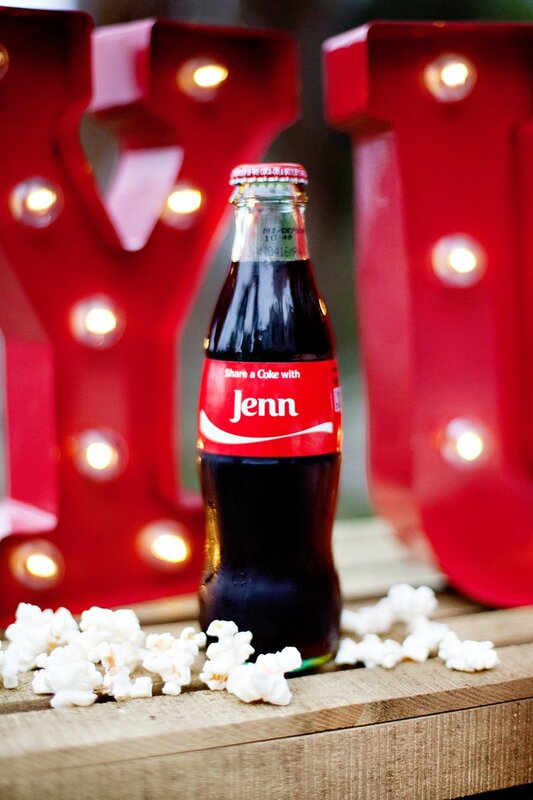 For the real showstopper though – make your guests feel extra special by serving personalized Coke bottles with their names on them! 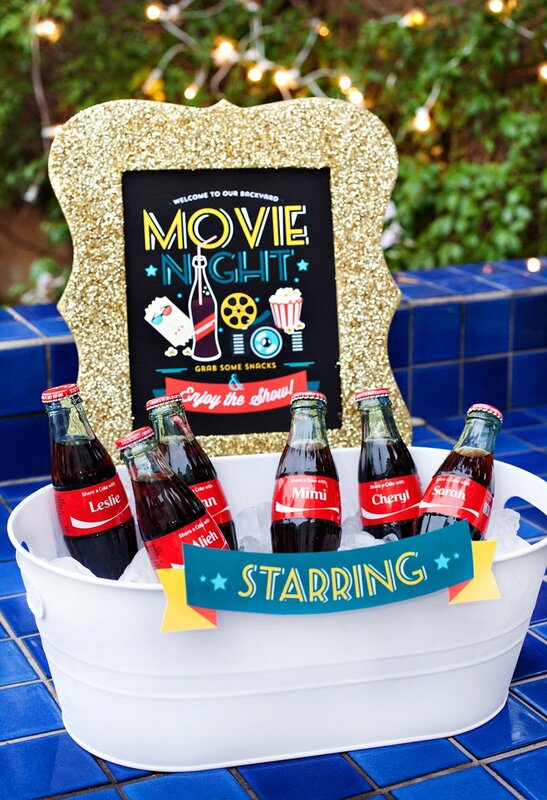 Display the bottles in an ice-filled beverage bucket with a little “STARRING” banner so that it makes them feel like the true stars of the party, which is how your invited guests should always feel, right?! 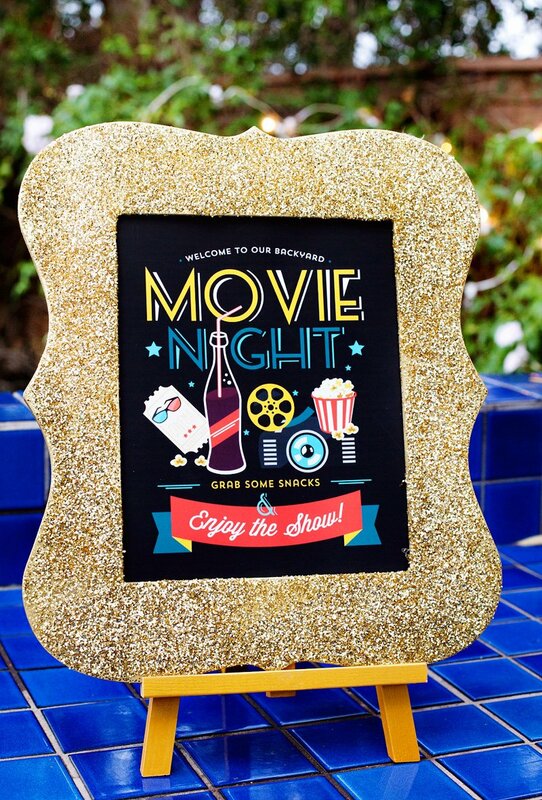 You can download the little banners and the rest of my Movie Night printables for free below. 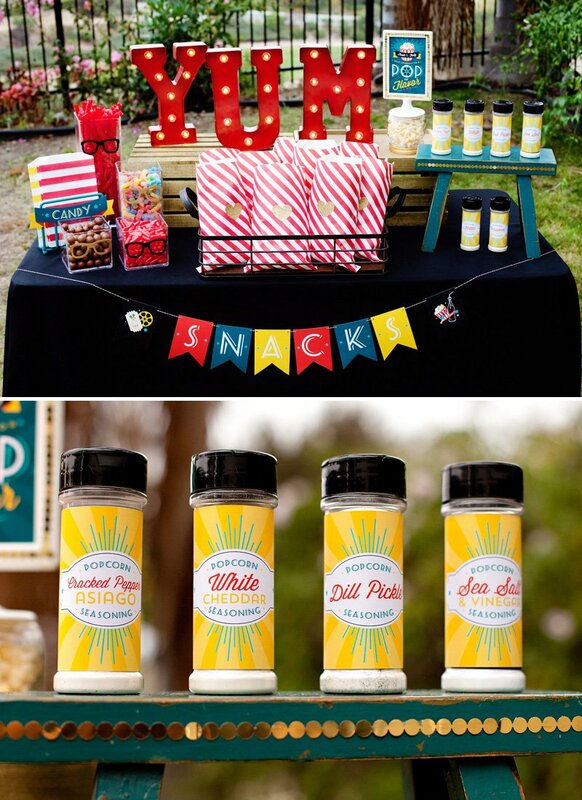 Since popcorn and movies go hand in hand, the highlight of my snack table here is the mini popcorn buffet! 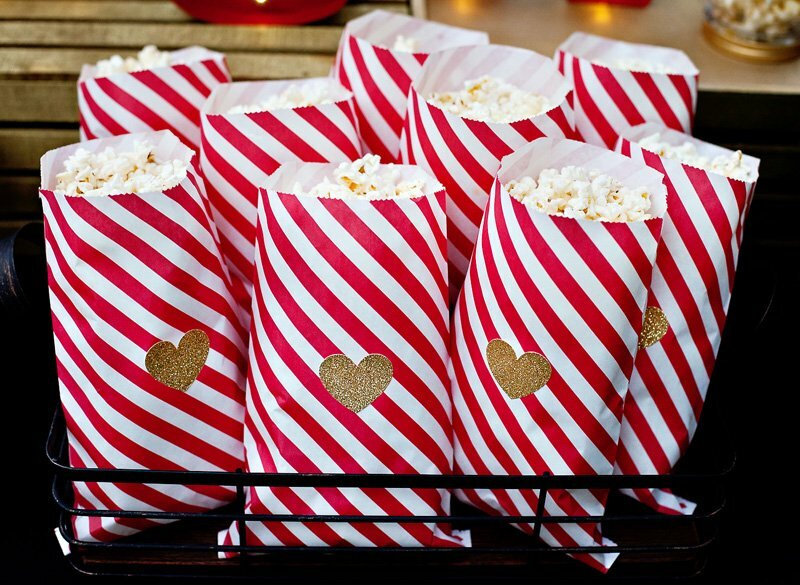 I filled red and white striped bags with fresh popcorn (which should be done pretty close to serving time), and added some cute glittery gold heart stickers to the front. 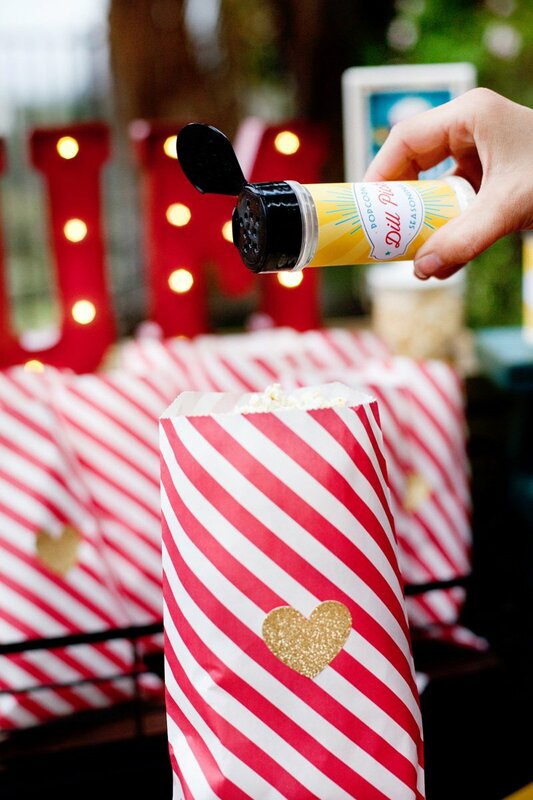 Have you ever tried Dill Pickle Seasoning on your popcorn? Might sound kind of random, but it’s surprisingly tasty… who knew! 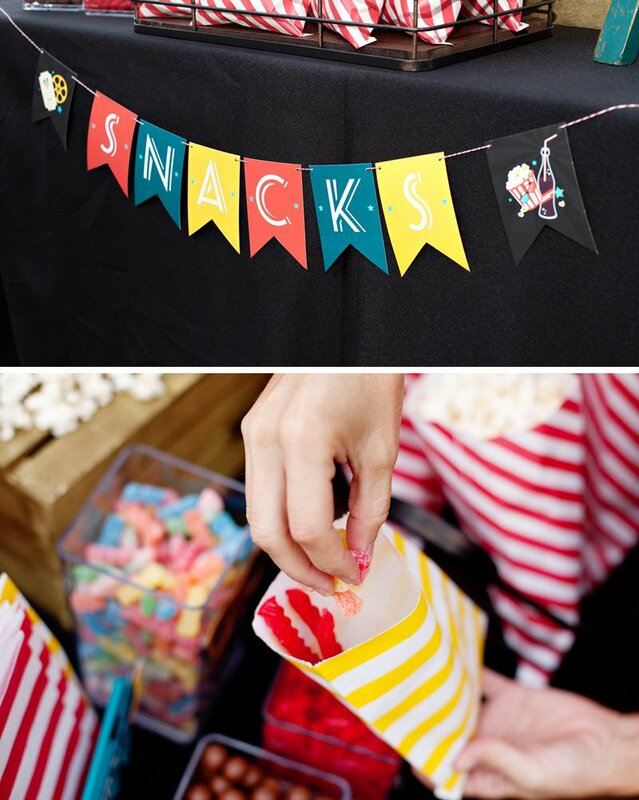 Here’s a peek at the printable SNACKS Banner. 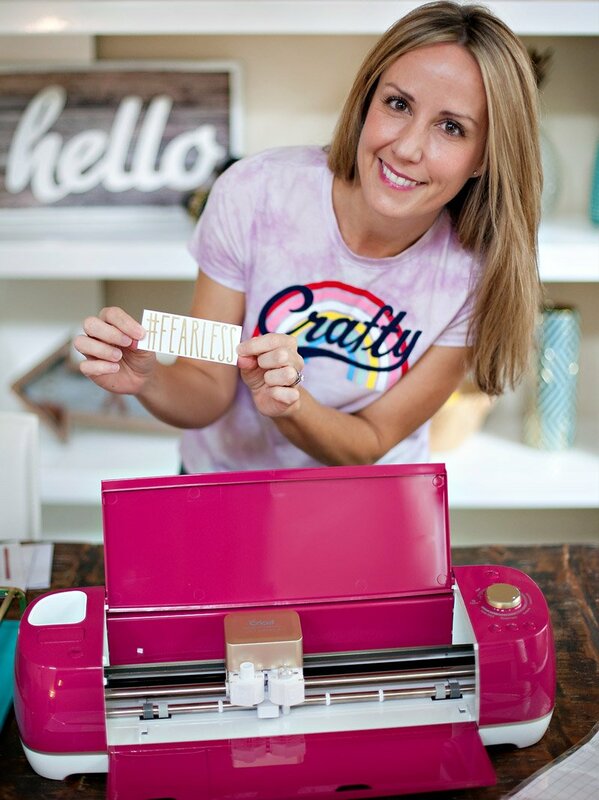 Just print, cut, and string onto baker’s twine. The individual panels are sized at 3×4.25 inches. 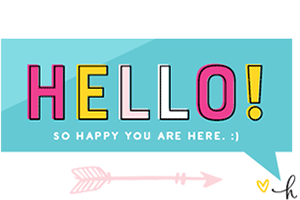 There’s also a 3rd decorative panel included in the printable file… and uou can always make extra banners by just alternating the 3 decorative panels. Now let’s talk about the CANDY real quick! I picked up a few movie theater favorites – Red Vines, Sour Patch Kids, Whoppers, and Hot Tamales – and displayed them in acrylic food storage containers. 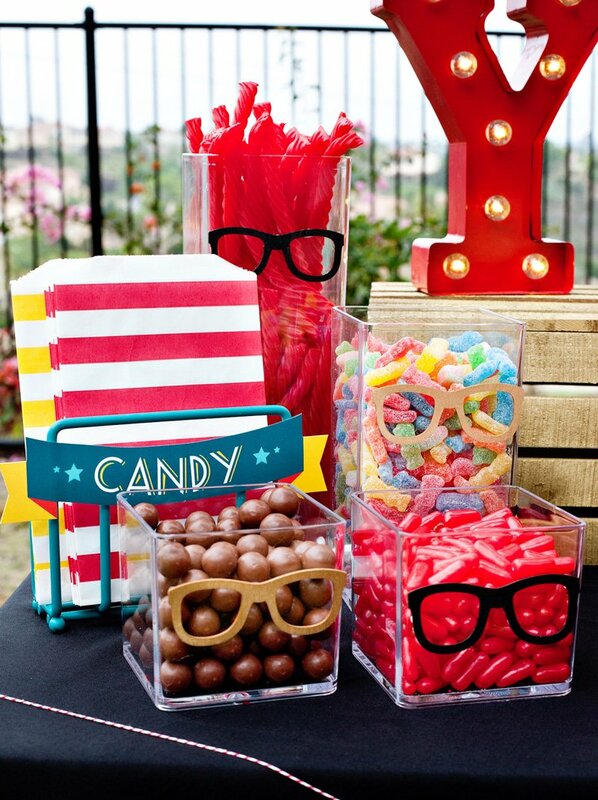 For a little kitschy fun and a playful nod to the idea of “viewing”, I embellished the candy jars with wood cut-outs shaped like glasses (which I found at Michaels). 3D glasses would be a cute addition too! Last but not least, here’s a closer look at the 8×10 Movie Night Sign since it’s a bit blurred in the opening photo. 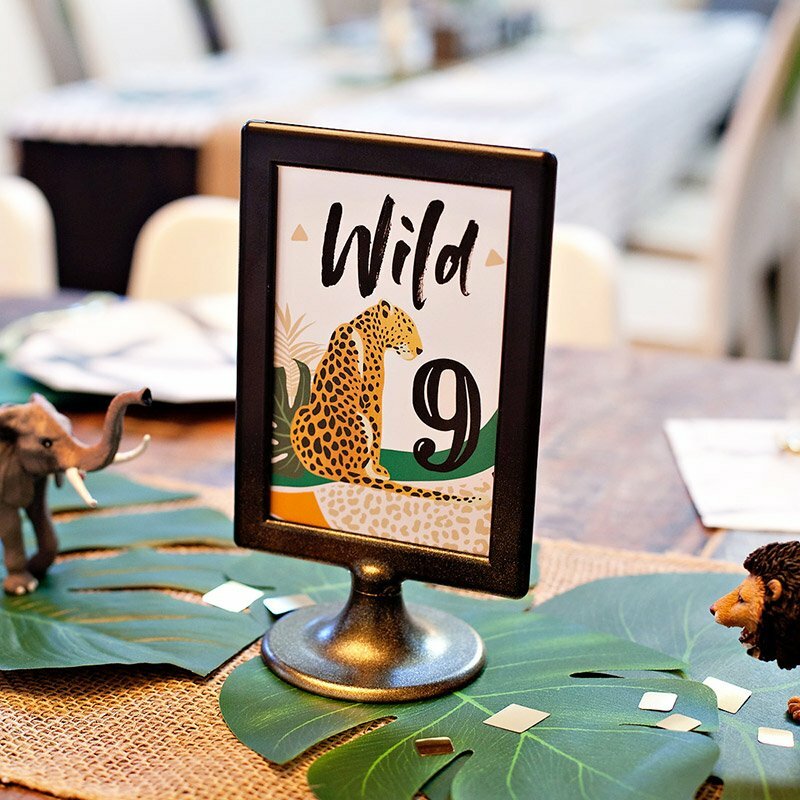 I displayed in a DIY glittered wooden frame that I made for a different party a while back and just keep coming back too. 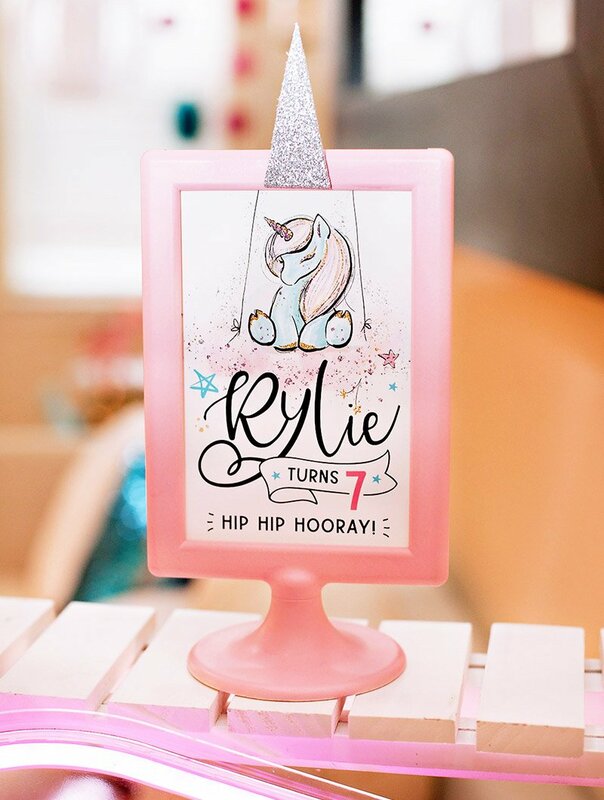 You can never go wrong with a glittery gold frame! P.S. 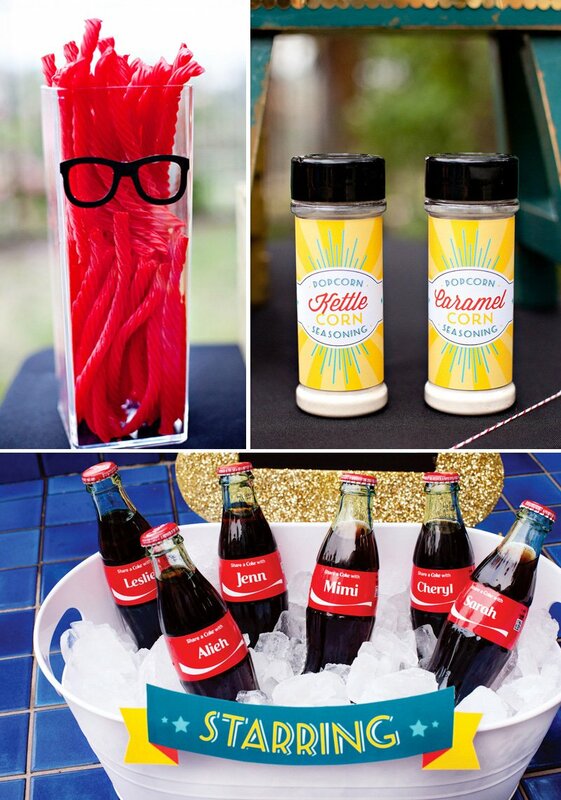 For more fun ideas featuring custom Coke bottles, check out my Retro-Glam Bridal Shower and Nautical Bridal Shower Ideas post, the latter of which comes with a chance for one HWTM reader to WIN A TRIP FOR 2! 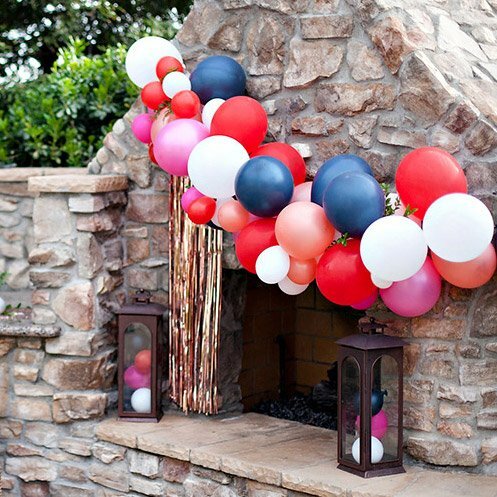 The contest ends on July 31st and just requires you to pin your favorite summer party ideas to enter… get the full scoop over on the original post.